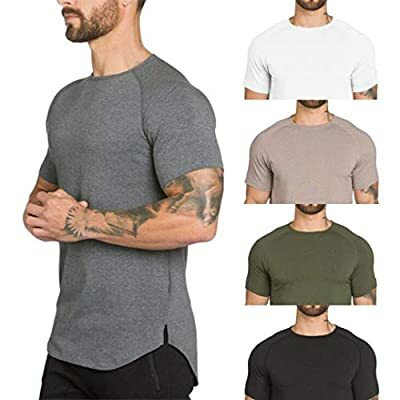 Muscleenergy are now selling the extremeley popular Gym T Shirts for Men,Overdose Men's Gyms Crossfit Bodybuilding Fitness Muscle Short Sleeve T-Shirt Top Blouse for a reduced price. Don't miss out - buy the Gym T Shirts for Men,Overdose Men's Gyms Crossfit Bodybuilding Fitness Muscle Short Sleeve T-Shirt Top Blouse online today!
? Size:M Bust:100cm/39.37" Sleeve Length:29cm/11.42" Length:72cm/28.3"
? Size:L Bust:102cm/40.09" Sleeve Length:30cm/11.81" Length:74cm/29.1"
? Size:XL Bust:104cm/40.94" Sleeve Length:31cm/12.20" Length:76cm/29.92"
? Size:2XL Bust:108cm/42.52" Sleeve Length:32cm/12.60" Length:78cm/30.71"
Great for Daily and Casual Wear, High Softness & Wearability. Please check your size with our SIZE CHART before you buy it. / The Color could be little bit different between on the screen and in practice. INCREASED MOBILITY: No one wants their clothes to be limiting whether you're moving or not. Get the apparal that gives you freedom and range where you need it most. TRUSTED DURABILITY: Whether you're at the gym or on the couch our shirt makes clothing that will withstand any activity or non activity. You can trust that your clothes will outlast the competition, just like you. If you want to show your muscle and body type, please select according to the normal size; if you like relaxed and comfortable, please choose bigger size.